Buffets are a great way to entertain particularly for larger groups. 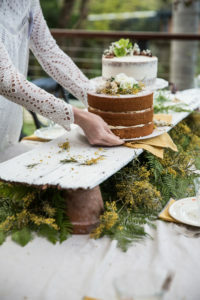 Unlike sit-down dinners, buffet service allows the host to be less tied to the kitchen and able to more fully enjoy the event interacting with guests. Aside from choosing food items that work well for buffet service, the host also needs to consider how to set it up. To take the overall look from ordinary to “wow”, consider these three things – color, natural elements, and height. Choose a simple color scheme to anchor the design, one that coordinates with the occasion, setting, a favorite piece of china or another decorative piece. Limit your scheme to 2 – 3 complimentary colors and use them in serving pieces, linens, floral or other arrangements, food tent cards, etc. Including at least one decorative centerpiece sets the table apart. 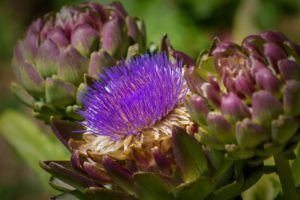 Consider using natural elements such as food items relating to the meal, leaves, branches, flowers, or herb sprigs. Place items in decorative containers or directly on the table. 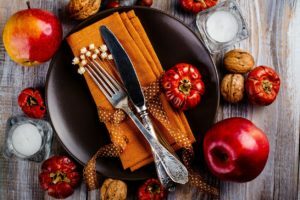 Keep it simple and be mindful of items that may stain tablecloths or placement that may interfere with the service of food items. 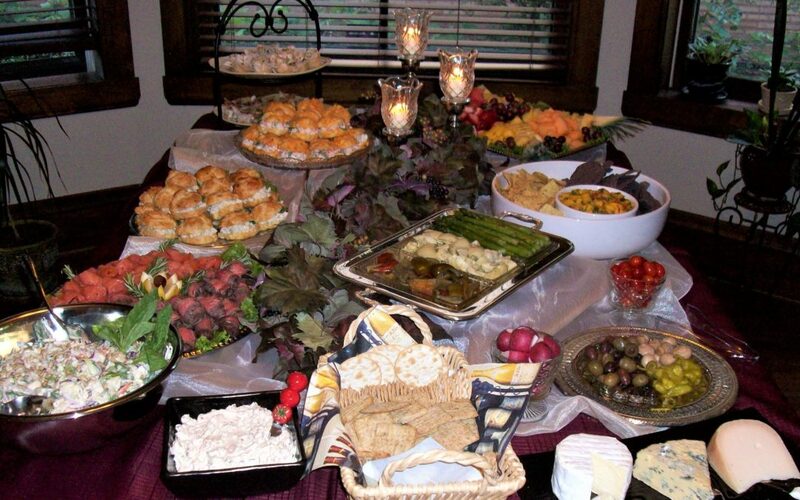 Placing food items at varying levels on a buffet table instantly adds visual interest and can aid in service. Use stacks of books, wooden boxes, footed plates or tiered serving pieces – anything that is sturdy to create a base. Bases can be covered with a tablecloth or other piece of cloth, or be left uncovered to add to the décor. If you enjoy this type of content and recipes, you may wish to subscribe to our free monthly newsletter. NEW SUBSCRIBERS can sign up here. Thank you!